“Total container shipments, domestic and international combined, rose approximately 5 percent during the first quarter of this year,” said Joni Casey, president and CEO of IANA. 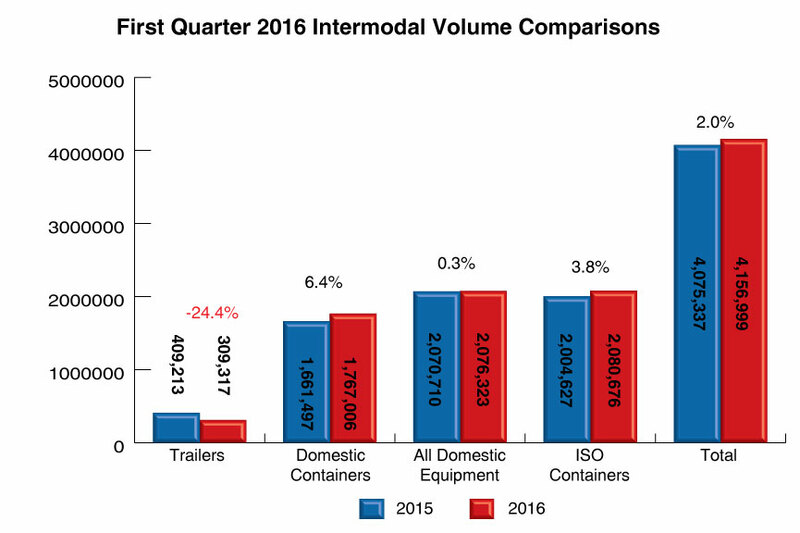 First quarter 2016 performance underscored intermodal’s core strengths despite results in the trailer segment, according to the Intermodal Association of North America’s Q1 Intermodal Market Trends and Statistics report. While intermodal trailer volumes declined a significant 24.4 percent, this market segment represents the smallest portion of total intermodal shipments and has been losing ground over the last several years. Domestic container loads recorded a 6.4 percent increase and combined with 3.8 percent gains in international volumes, netted 2 percent total growth for the quarter. The seven highest-density trade corridors, accounting for 63.4 percent of total intermodal volume, increased 4.7 percent against the more modest industry gain. While growth rates for each individual corridor varied widely, all were positive. The Midwest-Northwest corridor led with 10.1 percent, reflecting the strength of both international and domestic containers. Likewise, the Midwest-Southwest lane, which had the highest overall share of volume, grew 8.7 percent on container traffic that more than offset a decline in trailers. Weak international container imports incurred negative growth in specific regions, including Mexico, a new addition to the IMTS report. Exposure to trailer declines affected the regional picture more broadly. Nonetheless, the Mountain Central, Northwest, Southwest and Eastern Canada regions all had significantly greater than average intermodal growth rates. Intermodal Marketing Companies again demonstrated clear gains in the highway sector, up 15.4 percent from the previous year, thanks to excess trucking capacity. Intermodal loads fell 13 percent. The net result was a volume decrease of 1.1 percent. Intermodal Market Trends & Statistics is published quarterly by IANA and is available on a subscription and individual copy basis. Effective January 2016, IANA’s Intermodal Market Trends and Statistics includes expanded information on Mexican intermodal movements. Members of the press may request a sample copy of the 2016 First Quarter Intermodal Market Trends & Statistics from Tara Mullen at tara(at)intermodal(dot)org. The report features detailed analyses and reproducible graphical representations of Q1 2016 results. IANA is North America's only industry trade association that represents the combined interests of the intermodal freight industry. The association’s mission is to promote the growth of efficient intermodal freight transportation through innovation, education and dialogue. The association offers valuable information and services specific to the intermodal industry encompassing consensus business solutions that facilitate: operations, regulatory compliance, and policy issue management. IANA's membership roster of over 1,000 members represents the diverse companies critical to moving freight efficiently and safely. IANA provides a discussion forum for the many types of stakeholders along the supply chain, resulting in a strong unified voice advocating the needs of intermodal freight transportation. For more information, visit http://www.intermodal.org.